See the Fighter’s Road Top Decks, info on the set “Ultimate Stride”, and the new Messiah. Cardfight!! Vanguard Volume 12 comes with 2 Promos “Messianic Lord Blaster” and “Planet Corpse King, Brandt“. While the October 15th Event will feature Tokoha and Henri’s VAs. An “Animate Girls Festival 2017” special illustration. The illustrations will be released as Keyholders. Ultimate Stride on sale November 17th, 2017. 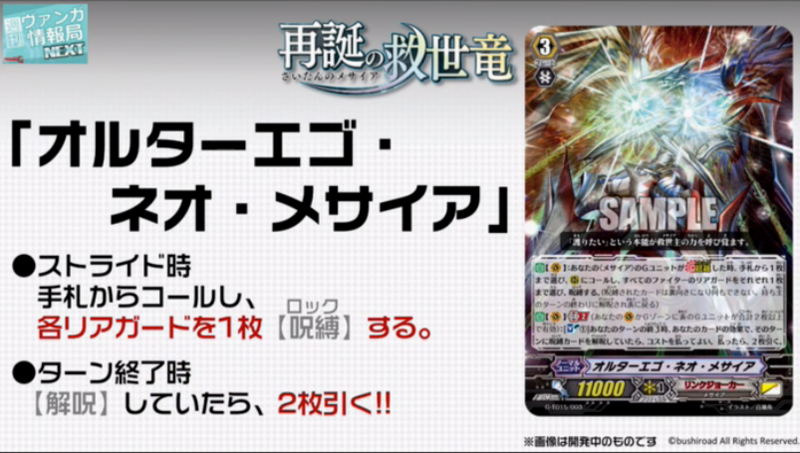 Aqua Force is focused on a new kind of Deck used by a Diffrider who appears in Z. All cards including Trigger Units for their Deck are available. Maelstrom and Thavas Decks also get boosts. Angel Feather includes a new Gavrial Unit. There will be new ways to Trigger Rescue even more constantly to apply even greater pressure to your opponent than before. AUTO: [Place this Unit into the Soul] During your turn, when your Unit Unlocks, if you have a <Messiah> Vanguard, you can pay the cost. If you pay it, draw 1 card, choose 1 of your Units, during that turn, it gains Power+5000. AUTO (RC) GB1: [SB1] At the end of a battle in which this Unit Boosts, you can pay the cost. If you pay it, choose up to 1 Locked Card, Unlock it, then Lock this card. Choose 1 of your Units, during that turn, it gains Power+4000. AUTO (VC): When your <Messiah> G Unit Strides, choose up to 1 card from your hand, Call it to (RC), then choose up to 1 card among all Fighter’s Rear-guards, each, Lock it. AUTO (VC) GB2: [SB1] When your turn ends, if a Locked Card was Unlocked due to your card’s effect during that turn, you can pay the cost. If you pay it, draw 2 cards.